“If you take responsibility for yourself you will develop a hunger to accomplish your dreams,” Les Brown said once. Ankur Kumar, who cracked NDA 2016 exam in his 2nd attempt, had the similar kind of hunger to join the armed forces since childhood. However, whatever he wanted to achieve didn't just fall into his lap. It came as a result of some sleepless nights, dedicated study routine, mastering self-discipline, and effective time management. If one's concepts are fundamentally clear, then there is not much to worry about, believes the topper. The topper not only cracked NDA, but also qualified exams like JEE Main, JEE Advanced, BITSAT, Indian Statistical Institute and Indian Navy as a Sailor. 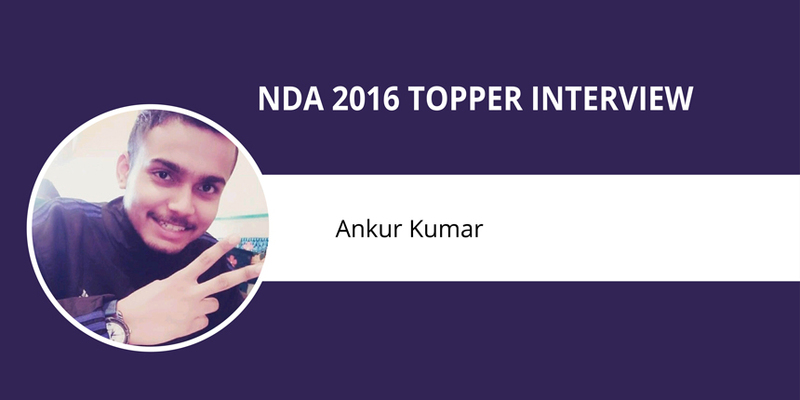 The NDA topper shares his success story with Careers360. Careers360: Tell us about your childhood and schooling. Who all are there in the family and what are their professions? Ankur Kumar: I was born in Patna, Bihar. I did my 10th from St. Karen’s High School, Patna and 12th from DAV Public School, BSEB Colony, Patna. I am a single child. My father is a businessman and my mother is a teacher. Careers360: What was your All India Rank, score/marks in NDA? Which year did you qualify the exam and when were you currently working? Ankur Kumar: I got 274 marks in written and 384 marks in SSB Interview by SSB Allahabad. I have qualified NDA exam in 2016. Careers360: What made you think that NDA is the career you want to pursue? Which all other exams did you appear in and which all have you been able to crack? Ankur Kumar: It was my childhood dream to join NDA. Many of my family members are in Army. I used to see the uniform and gallantry medals and these motivated me to join the Defence. I gave JEE and got 10500 rank in JEE Advanced. I had cracked BITSAT and Indian Statistical Institute. I was also selected in the Indian Navy as a Sailor. Careers360: How much time did you prepare for the NDA? Did you crack it in the first attempt? Ankur Kumar: I used to study for 4 hours on a regular basis. I cleared NDA written exam in the first attempt but was screened out. Finally, I was recommended in the 2nd attempt. Careers360: Tell us the challenges/difficulties you had to face during your preparation period? Ankur Kumar: Initially when I had started my preparation, it was with great josh and enthusiasm but the things changed when I had started revising them again and again. It became boring which I had to overcome and this became a challenge for me while preparation. Ankur Kumar: Yes. I took coaching for SSB Interview in Major HS Kalsi Academy, Delhi. It was 14 days course. Careers360: Tell us about your current role and responsibility? Please describe a typical day at work as your current work? Ankur Kumar: I am presently under training in NDA. A normal daily routine is waking up at 4 am, doing PT, getting ready for the classes. The duration of the classes are between 6 am hours to 8 am. There is an interval for the breakfast whereas the classes resume at 9.20 am and continues till 1 pm. After lunch at 2 pm, the timing for PT and sports is till 6 pm. We are given time for self-study till 8.45 pm where we can have dinner. At last, we have PT between 9.30 to 11.30 pm. Careers360: How should one prepare for NDA examination? Tell us the strategy you had applied for preparing. Complete the NDA syllabus of Maths of class 11th and 12th from basic books. Careers360: Is coaching important for cracking the exam? Ankur Kumar: Coaching is helpful only in guiding. Ultimately, it is you who has to put in the efforts. Coaching can be taken for SSB Interview if you have a zero background about defence. Coachings like Olive Green and Baalnoi Academy are good for guidance. Ankur Kumar: If you give your 100%, then there is a probability of cracking the 100%. It is important to study regularly and know the syllabus and pattern. It is important to solve the previous years’ question papers. Also, taking mocks can be beneficial. Careers360: Can you refer some good books with Author names for all the sections of NDA exam? Careers360: While preparing for NDA written exam and SSB, what different strategies should one make? Which part one needs to focus more on and why for all the stages? Ankur Kumar: Focus should be given on every part as you will go the next stage once you clear the previous stage. It is important to be yourself and be goal-oriented and focussed. Careers360: Any online test series you suggest for NDA exam? Ankur Kumar: I did not take any online test series. Careers360: What are some of the major challenges that one must be ready to take when considering a career in NDA? Ankur Kumar: While choosing NDA as a career, one must be mentally prepared for everything. You must train your mind in a way to be ready to face any challenge. Careers360: Tell us the complete selection procedure of NDA exam. Mention stages of exams and their weightage, salary, growth prospectus, etc. Ankur Kumar: First, the written is being conducted by UPSC. One who clears the written exam is called for SSB Interview by Services Selection Board (SSB). After being recommended by the SSB, medical test and document verification are done. The finally selected candidates are sent for three years training and then one-year training at IMA Dehradun. After successful completion of training, you will be commissioned as Lieutenant. The stipend is also given as a cadet in NDA and IMA. The starting salary of Lieutenant is approximately 80,000. Careers360: After which stage is the document verification done and what documents one should take with him/her? Ankur Kumar: Document verification is done on the first day of SSB Interview. One must carry the original marksheet of class 10th and 12th for verification. Careers360: What should one keep in mind while appearing for SSB Interview? On which areas do they test you on skills? Ankur Kumar: While appearing for SSB Interview the most thing is the interview is conducted to test your personality. There are 15 OLQs (Officer Like Qualities) which one should possess. Some of them are - to be honest, truthful and being original. If you have these qualities you will be selected in the interview. Careers360: Any messages for the future aspirants? Ankur Kumar: Be honest with yourself, prepare well, work hard, concentrate on the topics and be focused on your goals. Best of luck. Jai Hind.